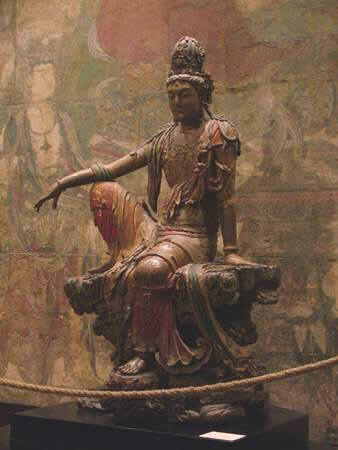 Guanyin (Kuan-Yin) is the bodhisattva of compassion and mercy as venerated by East Asian Buddhists, usually as a female. The bodhisattva Avalokiteśvara is her male form. 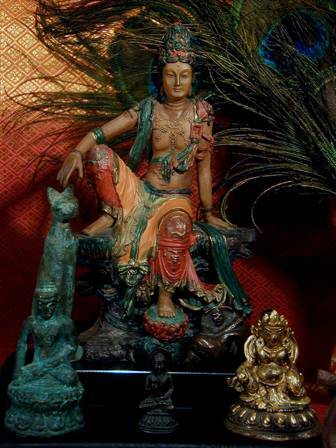 Within Tibetan Buddhism, she is Tara, the bodhisattva of compassionate action. In the West, Kuan-Yin is known as the Goddess of Mercy. Chinese Taoists revere her as an Immortal. The name Guanyin, also spelled Kuan Yin, is short for Kuan-shih Yin, which means "Observing the Sounds (or Cries) of the World." Photo taken by Trinity and posted here. All of these meanings—compassion, mercy, presence to the suffering of others, accessibility; intuition, esoteric knowledge, probing the hidden and illusory, bringing inner wisdom to consciousness—and the fact that she is sitting in a natural setting, make the Water and Moon Kuan-Yin Bodhisattva an appropriate archetype for the Dharmagaian spirit. May the Water and Moon Kuan-Yin guide us through this time. The most important thing we can do is to hear inside ourselves the sounds of the Earth crying.